Buxton Mountain Rescue Team’s Chairman Rick Mobbs and team member Andy Peet attended a Civic reception lunch at Macclesfield Town Hall on Sunday 6th of May 2018 to receive a Community Involvement Award on behalf of the team. 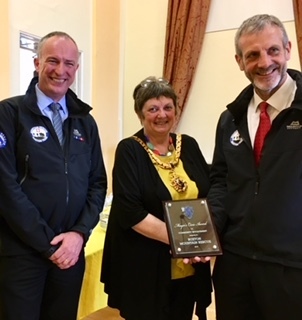 The award was given to the team “in recognition of a sustained and significant contribution to Macclesfield” and a recognition of the work that the team does in rescuing Macclesfield citizens from the hills around the Town. The Award was presented by the Mayor of Macclesfield Cllr Beverly Dooley.